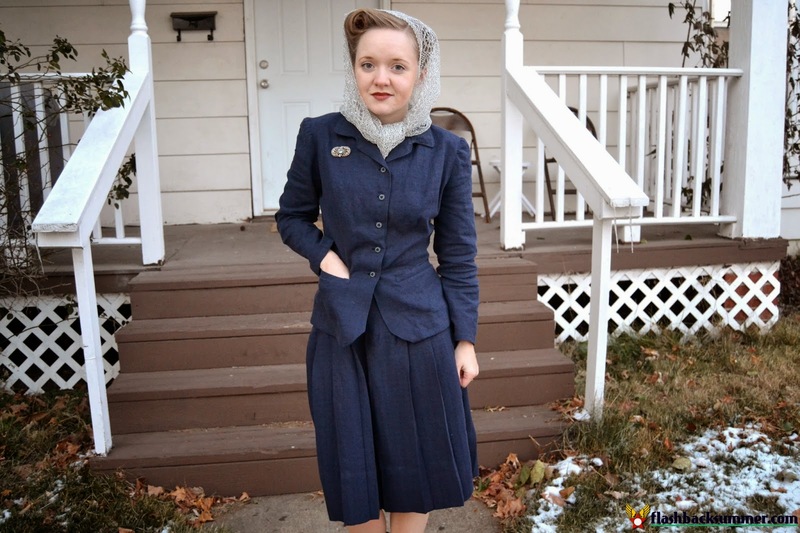 I combined a couple 1940s patterns I had to make this suit (the sewing details are at the bottom), and it's actually a really great idea! With the same fabric and notions, any two separate pieces can look like they're actually made to be together. 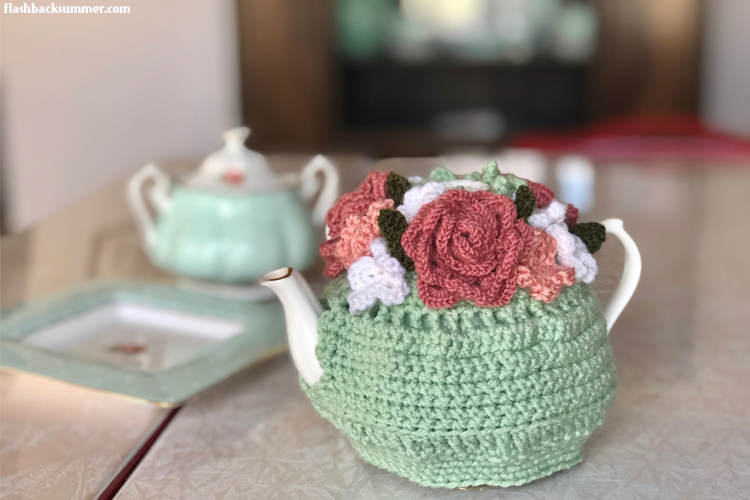 Most patterns of each decade have certain proportions and lines that were popular, and this allows them to work well with other patterns of that era. It can get trickier to mix patterns from different decades because of the different silhouettes, but it's still possible! I also lined this blazer with bemberg rayon in a gorgeous blue color, but I almost froze taking these pictures as it was and didn't even think to get a picture of the lining. Hopefully I'll get one soon and show you guys, because I splurged on this gorgeous lining (somewhat expensive by my standards) and it needs to be shown off! It really adds to the quality feel of the blazer and makes a huge difference, in my opinion. This suit was a great lesson in some tailoring techniques I don't use much like making the collar and bound buttonholes. I've been reading up on couture techniques for jackets, however, and while this is a great start, I'm not satisfied! I can't wait to get some books and learn more, and my next suits will be even better! How historically accurate is it? Very accurate! 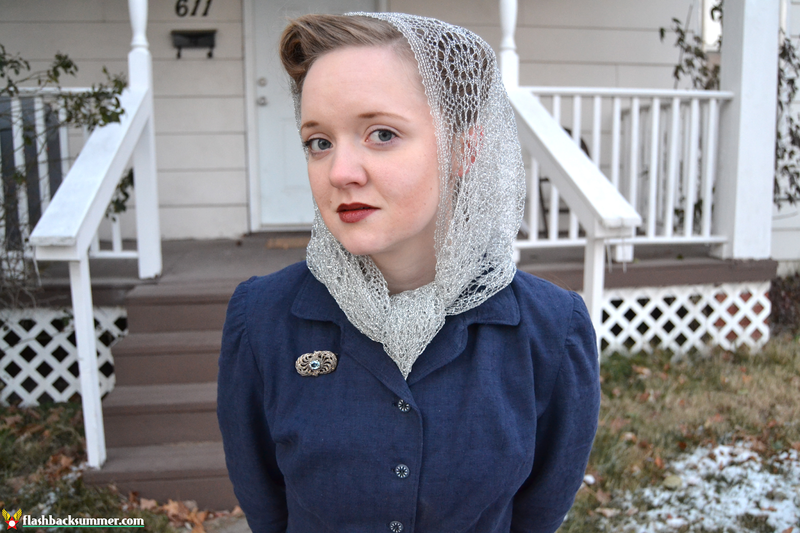 I used natural fabrics used in the 40s and 40s-appropriate techniques. The buttons are not very old, but I think they fit the style of the period. Any tricky parts to the pattern? The collar is a bit tricky where it meets the facing. But most collars are tricky there! 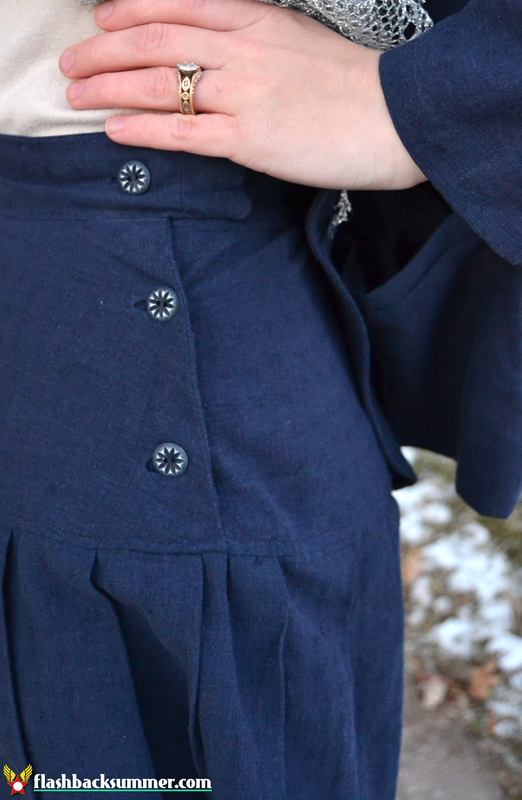 I had also not done pocket welts before, and although I had to read the pattern a few times to understand, I feel pretty good about how they turned out! Did you change anything? I used 5 buttons instead of 4 because they are small. I altered the sleeve length to fit me a bit better, but I think I'd add another inch next time. The sleeves are a little short. Notes: I would recommend sizing down, as with most 40s patterns. This 30" bust size worked well for me although I'm a 32", but the waist has less ease than the bust area. 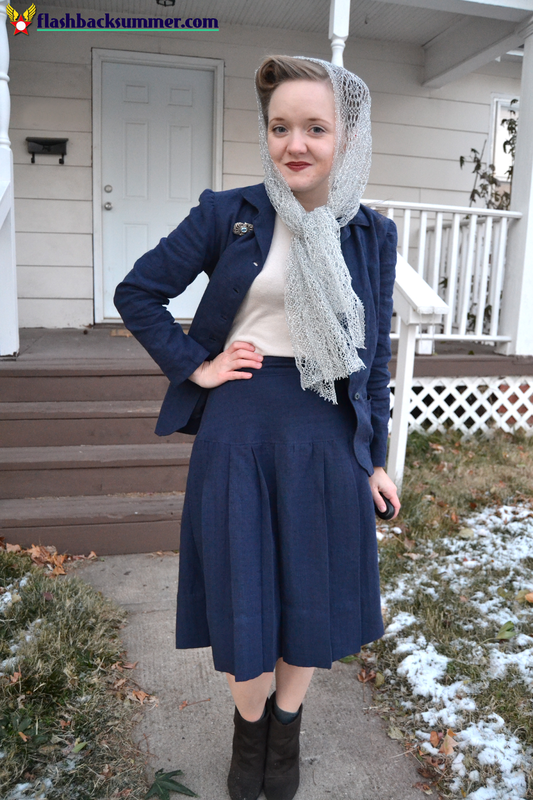 I think 40s blazers just tended to fit more loosely. 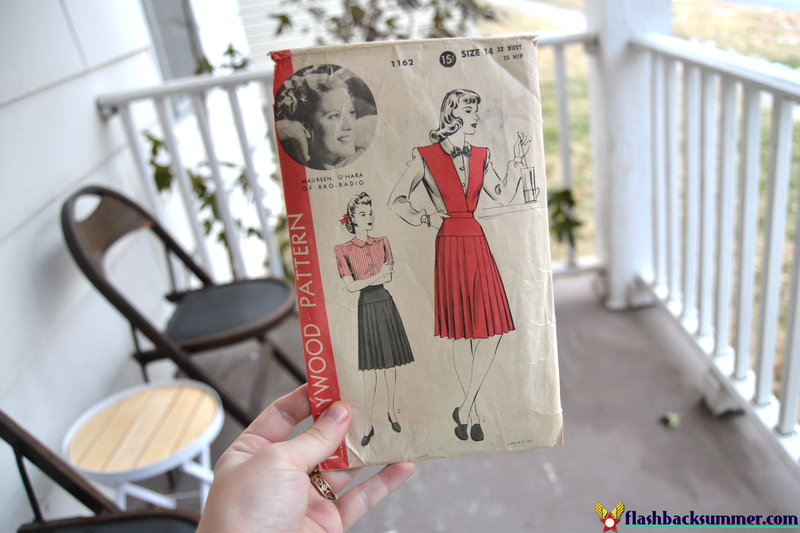 It would also be good to know how to insert linings, do bound buttonholes, and brush up on pockets and welts! How historically accurate is it? It's accurate. 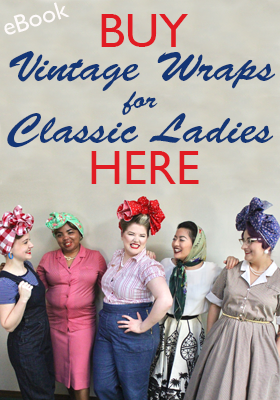 All the methods and materials are 40s appropriate! Any tricky parts to the pattern? Three things: I shot myself in the foot on this one and didn't alter the waist size correctly, which resulted in some make-it-work tactics around the waistband. Second, the pleats take a lot of time to do and you MUST sew ALL the skirt pieces together first to get their layout right! 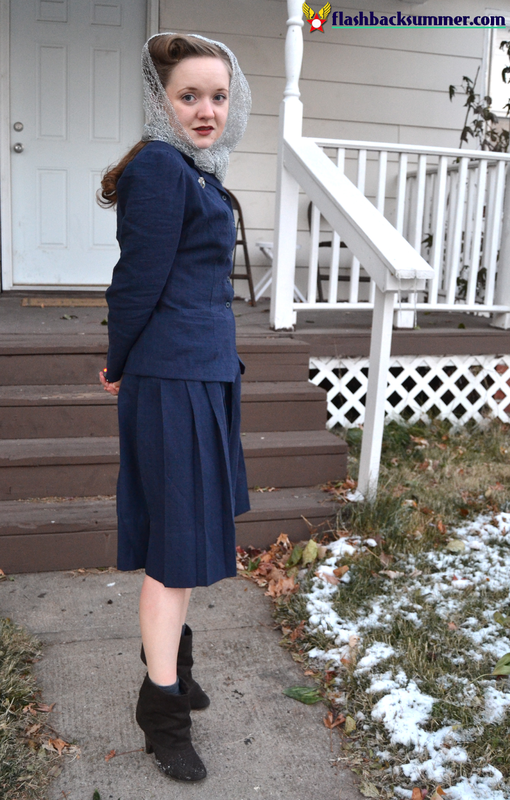 Last, the skirt bottom does NOT fit the skirt yoke circumference. It's a bit larger than the yoke, so plan accordingly! Did you change anything? Just altering to accommodate my waist mess up! Total cost: The pattern was a gift from an awesome friend, buttons from my stash, and I think the fabric would be around $20. Notes: Measure your pleated skirt top and compare with the bottom of the skirt yoke before preceding. Also, if you're not using a natural fabric, you can bake it (try at your own risk) or iron for permanent pleats. (The fabric will melt enough to set the pleats permanently.) 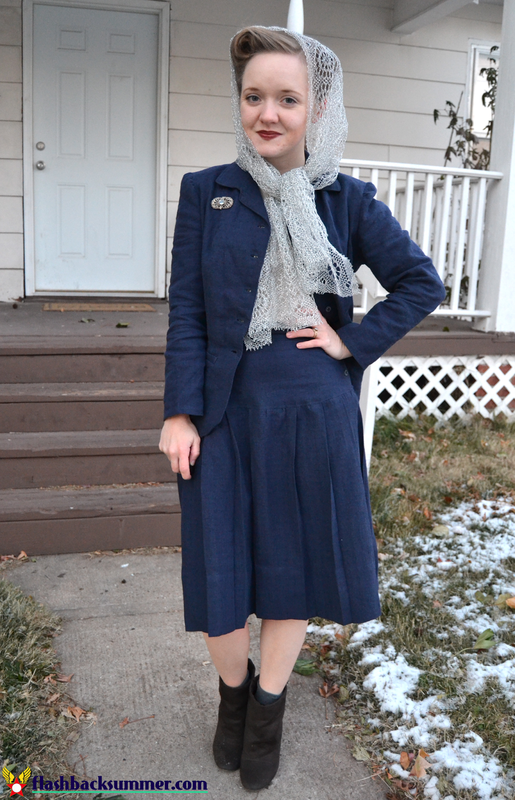 However, using natural fabrics means re-setting the pleats after every wash, just an FYI. 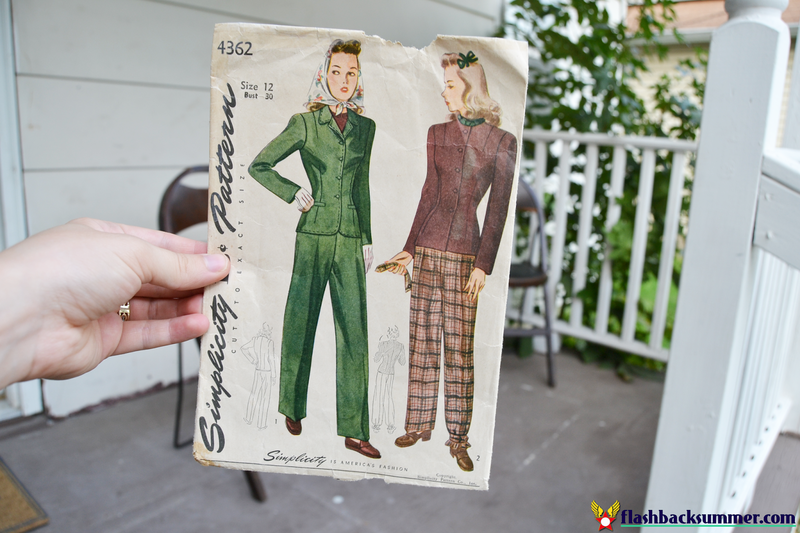 I have a couple of 1940's suit patterns that I've gotten out and put away..gotten out and put away. But after seeing what a beautiful suit you've made I want to get those patterns back out. And as always thanks for the notes! Really nicely done! I need to get on with making a suit. This is spectacular! Well done indeed! And I adore the scarf action you have going on! Great look! Great job, the blue really is a great color on you. You can use vinegar to set pleats, Historical Sewing hasan excellent tutorial explaining how to do it. Okay, I read about that, but I was wondering... won't it leave the skirt smelling like vinegar? I'll be reading that tutorial! Beautiful job! You should show us more work in process pictures:) Pleating is tricky and I'm so happy I have the nifty tool I bought a couple months ago. I also have a bound buttonhole tool from Dritz. They have recently reintroduced this tool so it isn't expensive to buy. 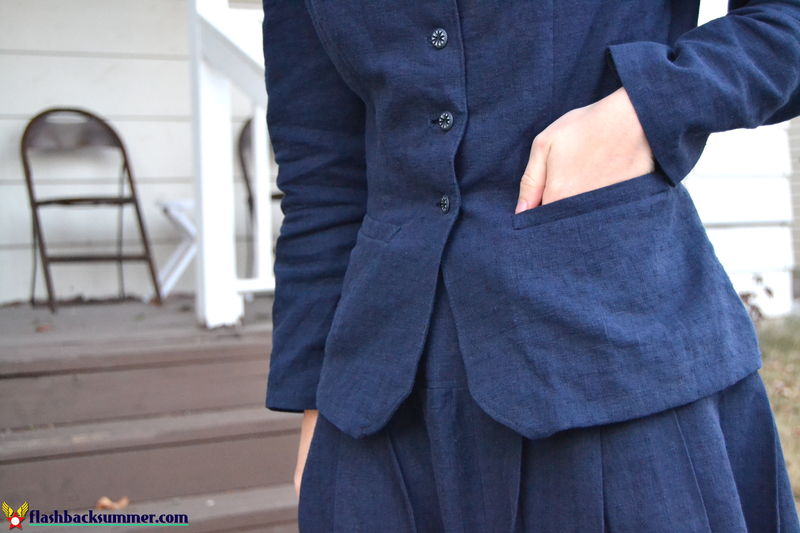 There is also one for large welt pockets too. 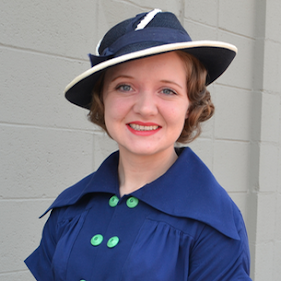 Gertie also has an excellent way to do bound buttonholes and discusses it in her book. You did such a wonderful job. You always have such enthusiasm for your projects and they are so nice to see. Just lovely! It is so nice to see these patterns come to life. I often see Bemberg rayon in ads, I would love to have some of the novelty print fabric from this brand. I do have some lining but I haven't used it yet. Thanks for sharing these wonderful pictures. 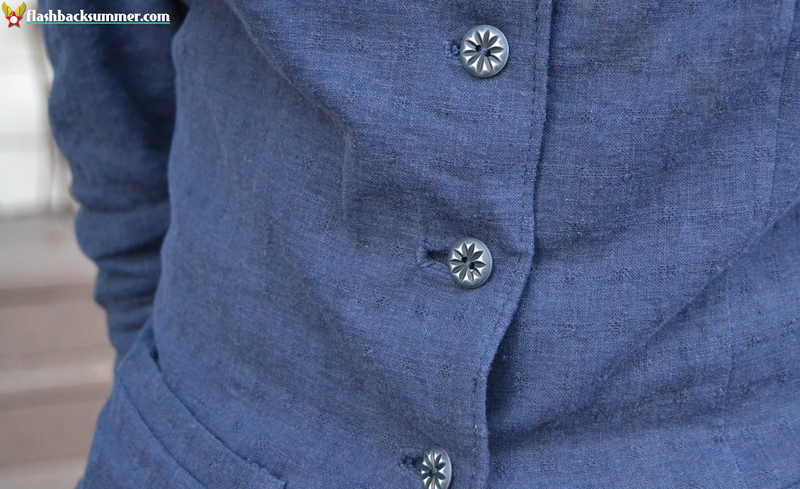 I especially love your button detail. Oh!! Very pretty!! Love it! You did so immensely well, dear Emileigh. This suit is gorgeous, looks like a mid-century heirloom, and looks like nothing short of a million dollars on you. I'm so impressed and inspired by your sewing skills. Congratulations! The jacket is especially lovely.